The first thing you need to do is buy some of QUAKERS Masa Harina de Maiz. It is a corn masa mix and sold everywhere is CA. If you cant find it, write the Quaker Oats Co.
at P.O Box 049003 in Chicago, IL. Or call information and they will probably give you a phone # for them. I always make them at Xmas, about 200! Then freeze. Its worth every minute.Okay....for about 3 dozen, buy; 1/2 lb. Soak all night to soften 2 1/2 pounds of beef or pork or chicken (or mix) 3 ancho chiles, roasted and cut into tiny strips (if you dont like chiles, dont use them) About 1 teaspoon oregano, 1/2 teaspoon cumin, 1 cup chopped onions, and 3 cloves garlic, 2 teaspoons salt, About 2 cups of beef stock, or any stock (canned chicken broth works.) 2/3 cup lard, 4 cups masa harina. (You have soaked the corn husks all night to soften. Throw the small ones in the trash Lay out larger corn husks and put into a pile somewhere. )Cook the meat (chick. beef, pork) about 1 hr. until well done (with all the spices and chiles onions, garlic etc.) reserve the broth, and string the meat when just cool. (Hard to string if cold!) In a large bowl (I use a Cuisanart) beat lard until fluffy. Put in the masa harina, some salt and some broth. Mix until it is the consistancy of a THICK cake batter. NOW TO ASSEMBLE: SPREAD about 3 tablespoons of the masa mixture in the center of a corn husk. About a half inch thick. Put about 1 large tablespoon of the meat mixture in the middle, lengthwise. Fold the husk over the filling, alllowing the plain part of the husk to wrap about the tamale. Fold bottom end up over the enclosed filling. 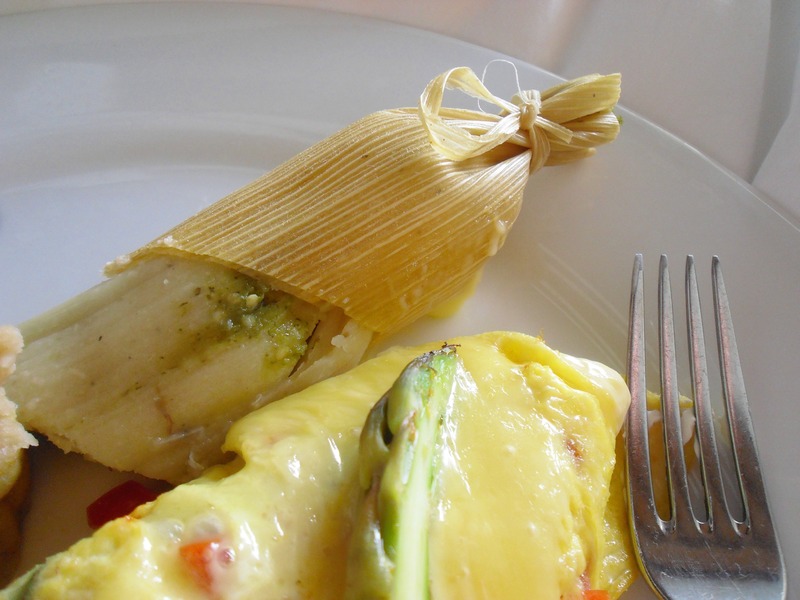 Arrange the tamales in a steamer basket or large dutch oven, UPRIGHT, with the water about an inch below the tamales. I first put extra husks under all. Simmer above the gently boiling water for about 2 1/2 hours or until tamales are firm and fall away from husks. Mexicans also make them with just potatoee, carrots, squash etc. You can add corn, raisins, anything you like. The biggest trick is trying to get them neatly folded into the husks. Its worth it, believe me. They are wonderful! Amore y pesetas y tamales y much tiempo para gastarlos! Louise King Recipe By : From: Big Flavors Of The Hot Sun By Chr File ftp://ftp.idiscover.co.uk/pub/food/mealmaster/recipes/mmdja ip.